TEHRAN, Iran (CNN) -- A U.S. journalist imprisoned for spying in Iran and in the midst of a hunger strike was admitted to the prison hospital to receive nourishment, her father said Tuesday. 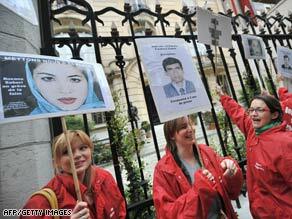 Reporters Without Borders members demonstrate on Sunday at the Iranian Embassy in Paris, France. Roxana Saberi was taken to the hospital at Tehran's Evin prison on Friday and was fed intravenously before being returned to her cell, according to Reza Saberi, who said his daughter looked "weak and frail" when he saw her on Monday. The 32-year-old Iranian-American journalist was tried and convicted on espionage charges in a one-day trial last month that was closed to the public. She was sentenced to serve eight years in prison. Saberi is appealing her verdict, and Iranian authorities have said they will make sure her appeals process is quick and fair. She launched her hunger strike to protest her confinement at Evin, which houses many Iranian dissidents and political prisoners. Iran's attorney general, Hojjatoleslam Dorri Najafabadi, said last month that Saberi's case "will go through its legal process like other cases," according to Iran's unofficial Shahab news Web site. He also said the initial verdict is not final and could be changed by the court of appeals, Shahab reported. Saberi's case has prompted sharp denunciations from President Obama and other U.S. and international officials. Saberi has been living in Iran since 2003, according to the Committee to Protect Journalists, a journalists' advocacy group. Iranian authorities revoked her press credentials in 2006, but Saberi continued to file short news items with permission from the government, CPJ said. Her reports were reviewed by a government minder, which is common practice in Iran, CPJ spokeswoman Meredith Greene Megaw said. Saberi was detained in January, although no formal charges were disclosed. On April 9, word emerged that she had been charged with espionage. Shirin Ebadi, an Iranian human rights activist, has joined Saberi's legal team. Ebadi won the Nobel Peace Prize in 2003. All About Roxana Saberi • Iran • Committee to Protect Journalists • National Public Radio Inc.